You may have noticed that I said the pork loin should be de-rinded. I didn’t say you wouldn’t want the rind as well. The ciccioli – as Italian pork scratchings (give or take) are known – make for very fine aperativo-accompanying morsel. Preheat the oven to 200C/400F/Gas 6. Open up the loin of pork, ready for stuffing, by laying it out in front of you vertically so that the thick part is on the left (I’m right-handed). Now starting at the top, cut through this thick part of the loin all the way down so that you can open it out to the left like a book. This will give you a larger surface area to lay the filling on. Spread the pungent garlic all over the meat. Then take the leaves from a few sprigs of oregano and dot them about too. Keep the stalks. Lay the pieces of ham horizontally over the pork loin, this way it will roll up more easily as the roll will follow the long length of the ham slices. Sprinkle the chilli flakes over the ham and then roll up the loin, starting from the open-ended side, keeping as tight a roll as you can. Secure the meat with string at 3-4cm/1-1½in intervals, knotting the lengths of string firmly. If you’re using stationer’s string rather than cook’s twine, dampen it first. I wish I could instruct you as to how to tie proper knots, but I do very bad knots myself. Were you to have the offer of a friendly hand - or rather finger - to hold the knot down as you tie it, take it gratefully. Cut the onion or shallots into thick slices without peeling them, and sit them in the bottom of a roasting tin to make the flavour-platform for the pork. Add the reserved stalks from the oregano, sit the loin on top and drizzle with the oil. Cook for 1¼ hours, when it’s cooked, the juices must run clear when you put a skewer into the centre and a meat thermometer should read 71C/160F. Transfer the tin to a heatproof kitchen surface, immediately pour the vermouth and boiling water into the tin and scrape all around the bottom of the tin so any oniony, meaty stuck-on bits dissolve into this instant gravy. You can let the meat rest in this sauce for 15 minutes or so. When you are ready to slice the pork, remove it to a board and warm the gravy (removing the onion bits) if it’s cooled. Cut the meat into approximately 2cm/1in slices, or in other words, thick enough for the slices to keep their shape and hold the filling. This size joint should give you 10 good slices plus the misshapen end-pieces. 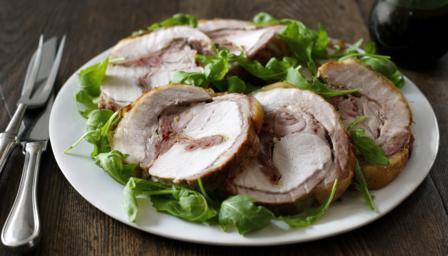 Arrange these sturdy slices on a bed of rocket with the gravy served separately in a little jug, or just sit them on a warm plate and pour over them a little gravy or any extra juices the meat has made. Take some more oregano leaves and slice them into fine strips, strewing them over the pork slices before serving.